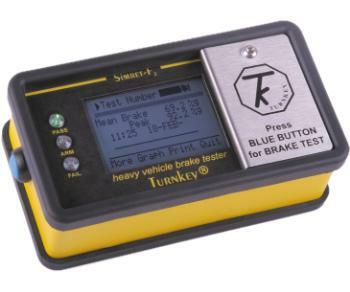 Simret F2 allows drivers to test their vehicles brake performance during the working shift. The driver presses a single button, accelerates to the recommended test speed and brakes to stop†. Simret F2 calculates the brake performance and lights green for a pass or a red for fail. Lights stay on (while the vehicle is running) for a preset time (1 hour to 10 days). Repeater lights can be fitted outside the vehicle to show it has been tested recently. Pass level, light lifetime and other settings are adjustable via the engineers controls (behind a secure panel). Results are saved on a exchangeable high capacity SD memory card for transfer to computer. There is also the option of transferring results via Bluetooth.